At Newstead Primary School we aim to teach our curriculum, wherever possible, through a thematic approach. We find children quickly become enthusiastic about the topic and we can capture that enthusiasm to develop subject specific skills in a purposeful and meaningful way. It also enables the children to see the connections between the different subject areas. Speaking and listening skills are developed as an integral part of our learning in all subjects. Through all our work we ensure that children's vocabularly is developed. The use of talking partners enables children to practise talk and dialogue for learning. We use 'Talk for Writing' to explore different types of talk, language extension and to retell and adapt well known texts. Reading in school begins with a phonics based approach to learning to read. More information about our approach to phonics can be found on the 'curriculum' page. The reading books we have in school are graded against book band levels to ensure they are at an appropriate level for the children's decoding skills. Reading comprehension also starts from the very beginning with guided reading sessions to explore understanding. Once the children have learned to reliably decode print, whole class guided reading lessons continue throughout Key Stage Two to explore the comprehension skills of inference, deduction, summarisation, word meaning etc. .
We encourage the love of reading through the reading of stories read to each class by an adult, the texts we choose to study in class, quiet reading and shared reading. We also promote the 100 book challenge within both Key Stage 1 and Key Stage 2. In the earliest stages of writing, children are encouraged to breakdown the sounds they hear in words and use their phonic knowledge and skills to write them down. Children are encouraged to have-a-go at writing in a variety of adult initiated and child initiated activities as well as guided groups with the teacher. We use class topics, as much as possible, for our focus on reading and writing activities. Talk for Writing strategies are central to the teaching in the school and give children time to orally rehearse before writing so they feel confident and clear about the content of their writing before they begin. Children are expected write at length at least once a week. We ensure children have a variety of purposes and contexts for their writing, including imaginative stories, newspaper reports, letters, diaries, instructions, persuasion and recounts. The children are taught the above style of cursive writing from reception age. 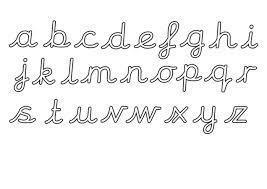 Children are taught to begin their letters from the line for every letter. Children are rewarded with a pen licence once they have achieved a consistent style of joined handwriting and can apply it to all of their books and work. They are presented with their licence in our Friday achievement assembly. We place a strong emphasis on the learning of key mathematical facts. We structure lessons using the White Rose Maths Hub materials and then support this by using various resources, including 'Numicon' and 'Maths No Problem'. We want all children to develop into confident and competent mathematical thinkers and to be able to apply their mathematical knowledge in a range of challenging and stimulating situations. Our aim is that all children develop a positive and confident attitude to mathematics, enjoy mathematics and reach their full potential as mathematicians. In Key Stage 1 we ensure pupils have confidence and mental fluency with whole numbers, counting and place value. Children work with numerals, words and the four operations of number. Pupils develop their ability to recognise, describe, draw and compare different shapes and use related vocabulary. Teaching also involves using a range of measurements such as length, mass, capacity, time and money. In Key Stage 2 mathematics teaching ensures children become increasingly fluent with whole numbers and the four operations of number, including number facts and the concept of place value. During this key stage children develop their ability to solve a range of problems, including increasingly complex properties of numbers and arithmetic. Knowledge and retention of multiplication tables are of high priority in lower Key Stage 2. School subscribe to 'Maths of the Day' which all classes use on a weekly basis to promote active maths. The science curriculum aims to develop childrens scientific knowledge and conceptual understanding through the specific areas of biology, chemistry and physics. Children develop an understanding of nature, processes and methods of science through different types of science enquiries that help them to answer scientific questions about the world around them. We aim to ensure children are equipped with the scientific knowledge required to understand the uses of science in the world today and for the future. In Key Stage 1 the children will be taught about plants, animals including humans, living things and habitats, everyday materials, light, sound and seasonsal changes. In Key Stage 2 the children will extend their knowledge of plants, animals including humans, living things and habitats and light and sound. They will also learn about evolution and inheritance, rocks, properties and changes of materials, states of matter, forces and magnets, Earth and space and electricity. The design of our curriculum ensures progressive art and design skills are experienced by the children. In Key Stage 1 children use a wide range of materials to create, design and make products. They use drawing, sculpting and painting to develop a wide range of art and design techniques and learn about the work of artists. In Key Stage 2 children develop their art and design techniques. All children in Key Stage 2 have a sketch book to record their observations and use them to review and revisit ideas. These books will follow the children through their Key Stage 2 years. They will opportunity to improve their skills in painting, drawing and sculpting and learn about great artists, architects and designers in history. The curriculum has changed signifcantly within this area recently. The schools computing curriculum has been updated and now provides children with opportunities that include understanding what algorithms are, creating and debug simple programs and understanding computer systems such as the internet. The children are also taught how to use technology safely, respectfully and responsibly. In school we use 'PurpleMash' to help enable the teaching of this curriculum along with other web based programmes such as 'Scratch'. Children also have access to laptops and computers to produce their work, make powerpoint presentations and research information. Design and Technology work is linked to the topic work within the half term. Children are taught design technology within the design, make and evaluate system. They also gain technical knowledge as they study. The children are given opportunities to develop designs, evaluate suitable materials, make prototypes and use a range of tools and equipment cut, join, shape and finish products. Cooking and nutrition is taught within design and technology. The children are taught about the principles of a healthy and varied diet and where thier food comes from. They have the opportunity to prepare and cook dishes using a range of cooking techniques. The Geography curriculum aims to inspire a pupils natural curiosity and fasination about the world and its people. Children are taught geographical skills under four main headings: locational knowledge, place knowledge, human and physical geography and geographical skills and fieldwork. The History curriculum will help pupils gain knowledge and understanding of Britains past and that of the wider world. All pupils will develop a chronology of events and people through time and should be able to ask inquiring questions relating to periods of history in living memory and beyond. Pupils will be taught about events such as the Great Fire of London and will study periods of history such as Stone Age to Iron Age. At Key Stage 2 our chosen language is French. We focus on practical communication to broaden the pupils knowledge of a language different to their own. At Newstead Primary School we teach according to the 'Sing Up' scheme of work. We ensure children have the opportunity to perform, listen, review and evaluate music across a range of periods, genres, styles and traditions. We follow the Nottinghamshire agreed syllabus for RE in common with all other maintained schools in Nottinghamshire. This ensures a mix of learning about Christianity and other World Religions through themes.